Use mindfulness techniques to handle toxic stress in the workplace and to create your ideal professional experience from the inside out. While working in a particularly toxic environment, Karlyn Borysenko came to this liberating realization: she couldn't control other people, but she could control herself, her perspective, and her actions. Now an organizational psychologist, consultant, and executive coach, Borysenko shows us how to bridge the gap between where we are now and what will bring us the most professional success and happiness. We must achieve self-mastery--by accepting responsibility for our actions, understanding our innate work style, and discerning when and how to push outside our comfort zone. In Zen Your Work, Borysenko shows us how to set personal goals that allow us to focus our energy and create measures of success that aren't affected by the cynicism, competitiveness, or narcissism of others. Borysenko teaches us to apply mindfulness techniques in a highly practical way to achieve professional success, create game-changing relationships (even with the most negative people in the office), decrease stress, and enjoy a better work/life balance. Karlyn Borysenko, MBA, PhD, is an organizational psychologist, consultant, and executive coach. As the creator and owner of Zen Workplace, she helps individuals find greater happiness and fulfillment in their professional lives, and helps organizations around the world to create positive employee experiences that drive productivity. Her approach is grounded in organizational and positive psychology and draws on mindfulness techniques. 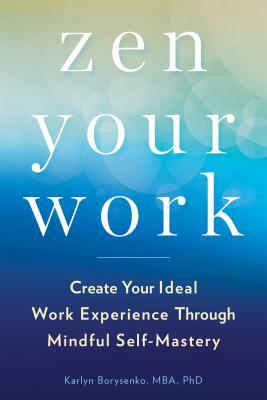 "Zen Your Work provides tips and relevant exercises to help employees develop the necessary mindset to be happy at work, despite difficult people or circumstances." "Zen Your Work is a fantastic toolkit for anyone who wants to create the most meaningful work experience possible, regardless of their coworkers' moods, organizational change, and other external circumstances. The book will help you understand your strengths and biases so that you can enjoy smoother, less stressful interactions and greater success." "Zen Your Work is a wonderful book for coping with everyone at work, including high-conflict personalities. From how to start your day well, to the stories you tell yourself on-the-job, to building strategic relationships, Dr. Borysenko gives lots of tools and tips for finding and creating your ideal work situation. After reading this book, you’ll know how to thrive (not just survive) regardless of what everyone else does. Surprisingly simple, clear, and friendly."